Just recently we shared the news that Coleco wants to bring back its version of Donkey Kong, with the planned ColecoVision Flashback in the works and the company hoping to re-release the version of the DK arcade title that graced the original console. When we say 'company', it's worth observing that the Coleco name has changed hands over the course of its history, though we're sure dedicated retro gamers of a certain age are interested in this release. A detail that we missed, and has been spotted by Tiny Cartridge, is that Coleco is also planning to bring back its Mini Arcade systems; this was announced at the start of August. 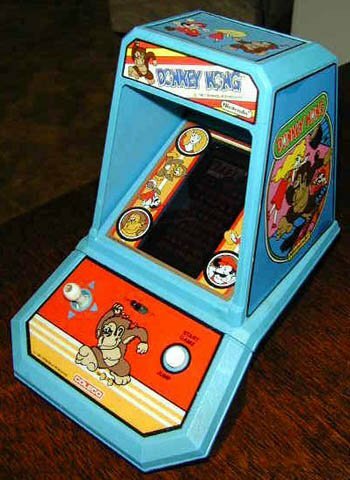 Five varieties of these tabletop systems were released that brought some major franchises to homes in yet another format, and there was one that provide a crude representation of the Donkey Kong arcade, pictured below. This'll face the same licensing challenge as the ColecoVision re-release, we suspect, though would be another neat collectible. We defy anyone to look at that cute little arcade stick and not be a little tempted; the Mini Arcades are planned for a comeback once the ColecoVision Flashback has been released. Just in time for the holidays? Hopefully it'll include all the gems we grew up with. I'm definitely getting one. Lets just hope theyre not 100-200 dollars. I hope they have a decent selection of games. As long as they're not too expensive, I'll totally be picking one up! I will get one if priced right. I had the frogger mini arcade way back. How I miss that mini arcade box of fun. It had a bright screen with zero input lag. If the mini arcades are reasonably priced, then I'd buy them in a heartbeat. I have all 5 originals(Donkey Kong, Galaxian, Frogger, Ms. Pac-Man, & Pac-Man)and some others that are a different shape(Donkey Kong Jr., Q*bert, & Zaxxon) as well. I'd love to see these come back though, along with some new ones. I had the Coleco power pack, and on the packaging it had a Donkey Kong Jr. pictured that was the exact same shape as the other 5; but it never was released for some reason. I'd buy that one if it came out. I had a Pac-Man one of these when I was a kid and I played the heck out of it. Loved it so much. Q*Bert was Parker Bros, not Coleco. Unlike Donkey Kong, the Coleco DK Jr. is actually Nintendo's own DK Jr. Tabletop with different artwork. It was made by Nintendo, but published in the US by Coleco (a good decision to go with Nintendo's design since it's awesome, though). The Mini Arcades were good stuff, though. I have the Galaxian one. It's not very true to the arcade, but it's a lot of fun. It also has a SI clone as an alternate game mode. I hope these Mini Arcades stay true to the originals. It is disappointing that Excalibur's Frogger used a shell similar to Coleco's (though with licensed technology from Nintendo with a similar set up to Nintendo's tabletops where they were non-lit, mirrored color LCDs with a spot to let light in), but was different from the Coleco tabletop. @Ryno You must have a lot of space to store things. :/ How many full-size arcade cabinets were you planning on buying and maintaining? In all seriousness, the attraction is the form factor and the nostalgia for those who've played these in the past. The gameplay is rather limited but they are bright and colorful and some are pretty fun. I owned that DK and loved it as a kid...why oh why did I not keep it!?!!!!! I've looked for them on Ebay and they're either a rip off or have the side stickers ripped-off. Highly tempted to buy them all this year. I'd love to get these and the colecovision flashback. @KnightRider666 Zaxxon and DK Jr are coleco systems, they did 7 in all, and Qbert was made by another. You have the complete set of them so consider yourself lucky as they get expensive. I've got DK, PacMan, a dk manual and the perma power cells. Beyond that I have Qbert too but also Crazy Climber and the 2000s modern Frogger from Excalibur as well. I used to have DK Jr, wish I still had it. They're fun. I figure the new ones will price like the frogger re-release from a decade ago around the $30-50 mark depending how they make them. Nice! Here's hoping they have a better battery life though, and are cheaper.